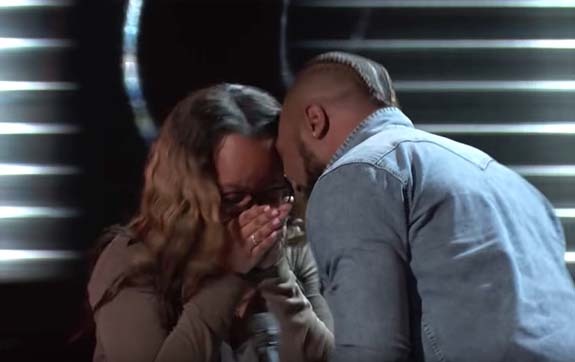 Having just secured a spot on Team Legend during Monday night’s Blind Auditions on The Voice, R&B crooner Denton Arnell asked judge John Legend if he could bring his girlfriend, Tiffany, onstage to share the special moment. What happened next will live in infamy as one of the most embarrassing (and romantic) unscripted moments in television history. 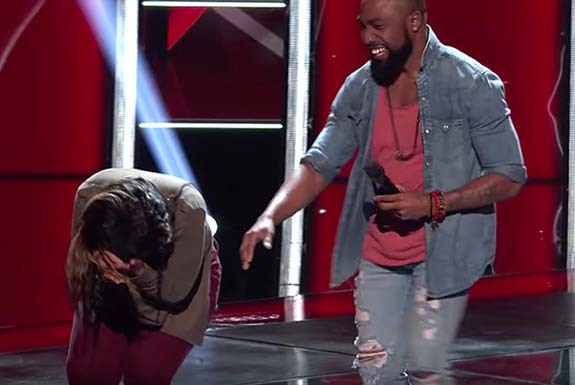 The 10 million viewers of The Voice will brag one day that they witnessed the scene playing out in real time. “Can she come up?” asked the 31-year-old Chicagoan. “Yeah, why not?” said Legend. “Being that [John] gave me a yes, I want to see if Tiffany would give me a yes,” said Arnell. At that point, the handsome suitor reached into his pocket and pulled out a black ring box. The crowd erupted, anticipating a made-for-TV moment. Tiffany closed her eyes and leaned forward as she pressed her palms to her face in disbelief. At the exact same time, Arnell, looking down at the diamond engagement ring, also leaned forward as he settled down to one knee. Their microphones magnified the “thwack” of their heads coming together in a comical “Three Stooges” moment. The studio audience roared with laughter and coach Kelly Clarkson could hardly contain herself. Tiffany stumbled, but despite the scary sound of skulls clashing, came up smiling. Arnell, clearly amused, was now able to get back to business. This time, Arnell safely descended to one knee and slipped the ring on his girlfriend’s finger. Tiffany tearfully accepted his proposal and the couple embraced. The home audience was then treated to a reaction shot of Legend — sporting an ear-to-ear grin while leading a standing ovation. Arnell raised his arms victoriously and Tiffany remained overwhelmed, her hands covering her face. Please check out the video of Arnell’s performance and the ensuing proposal. Arnell’s request to bring his girlfriend onstage starts at the 2:15 mark. Credits: Screen captures via YouTube.com/The Voice.